To get to the airport to fly back to the US, I took the 7:00 AM Israeli settler bus this morning from Hebron’s Shuhada Street – ghost town of a street that that has been closed to Palestinians, with its shops and doors welded shut, since 1994 when an Israeli settler massacred 29 Palestinian worshipers in the Ibrahimi mosque. Some soldiers came over to talk. They asked if I was with the Jews or the Arabs? I said that I am a Jew but but for all people, a member of the US organization Jewish Voice for Peace. They responded that they were familiar with Jewish Voice for Peace, and on the express how pleased they were that I am a Jew. One of the soldiers pronounced proudly, “I killed a Palestinian” referring to one of the teenage boys who had been shot dead two nights before in the Hebron neighborhood of Tel Rumeida where I was staying. he pointed to the stripes on the shoulder of his uniform to show his rank. I asked if death had been necessary in that stabbing attempt, that the knife was merely a mild kitchen knife. With all their guns and gear and military supplies, did they have to kill? Couldn’t they instead have subdued, wounded, arrested? “No,” they replied, “if he didnt kill him he would come back and kill us.” I asked how the boy could come back to continue his knife attack if he were wounded in the ground? “Later, he would,” The soldier replied. I told him that taking a life is what causes more [revenge] attacks. the soldiers made clear that they will always use their guns to kill when attacked. The conversation continued and soldier stated that this was the second life he had taken. He had also killed in Lebanon. Soon one of the soldiers soldiers lost interest in this topic and looked for a picture to show me on instagram if an American who had visited and brought them chocolate. Tonight is the first night of Hanukkah. I will be home in Ithaca to light candles and eat latkes with my children. In my head Woody Guthrie Happy Joyous Hanukkah has been playing. “Eight are the nights of Hanukkah, happpy joyous Hanukkah.” I’m trying to reconcile the joy I find in the Jewish holidays with the horrors I have witnessed this month in Hebron. On Saturday I will join my Rabbi for Havdala at my synagogue to have an conversation work our congregation about my recent experiences in Palestine and Israel. I don’t know yet what I will say about my conceptions of God and Judiasm and prophetic Judiasm. I ask you, God, for strength in this time when Jews take pride in our abilities to kill. This past week I have had the pleasure of experiencing Palestine with my dear friend, Tali Ruskin, of Jewish Voice for Peace – Boston. Below is her update of our recent experiences. 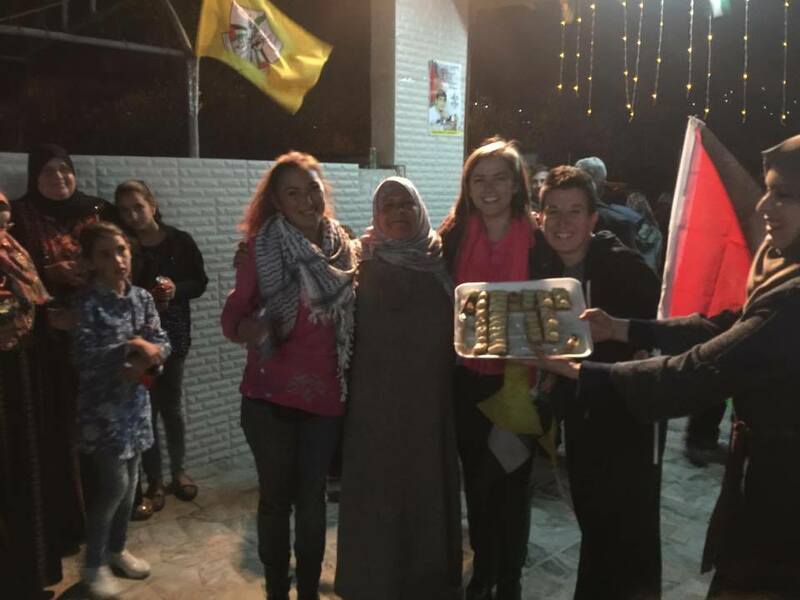 “The next day, i went to Hebron to meet Ariel, a JVP activist and CODEPINK staff person, who has been staying with Youth Against Settlements (YAS) in Hebron [click here to help support YAS]. there was a new international volunteer who had just arrived, so i went with Ariel to show her around the old city, since a lot of what internationals do is act as a protective presence from the soldiers and settlers when the kids are walking to and from school, when houses are being raided, etc. our first order of business was to walk down to the market (about 1/2 mi from the YAS center) to get shoes for the new volunteer. however, it ended up taking us 3 hours to get down there, as we were forced to play what we’ve been calling “checkpoint roulette.” the most direct route was restricted to us because the soldiers had decided that morning when Ariel walked that way that Jews aren’t allowed to go that way. eventually we made it to the market, as things were closing, got shoes, and then started the trek back to the center. this time we weren’t allowed through a different entrance because the soldiers identified us as anarchists to their commander on the walkie talkie, to which he responded, “ta’if otam!” which loosely translates to “shoo them away!” we took an overpriced taxi back to the center, where we worked with the other international and palestinian activists on the new YAS website. the next morning, ariel and i headed to Tel Aviv to meet with the Coalition of Women for Peace. Ariel had never taken a settler bus, so we decided to give her that experience. we walked down to the bus stop on Shuhada street, which used to be a bustling palestinian market, but has been closed to palestinians for almost 20 years, so now it’s ghost-town-y, with all the shops closed up (see pics). ariel and i sat at the bus stop for about a half hour watching the only activity on the street – young settler guys out for a run on the empty streets and soldiers going in and out of their base located there. eventually we boarded the bulletproof bus with tens of extremely unfriendly passengers. the ride to jerusalem took forever, as the bus went into every nook and cranny of the settlement before getting to the main highway road. from Jerusalem, we took a bus to Tel Aviv, filled with obnoxious Israeli teenage boys bro’ing out with each other. arriving at CWP was a huge relief! we met with 3 of the staff members, who were all amazing badass feminists. they talked to us about the organization, explaining that CWP overall aim is to bring a feminist analysis to anti-occupation work, and anti-occupation analysis to feminist work. not surprisingly, much of the resistance in palestine is doused in masculinity/machismo, so it was very refreshing to hear from them about their work. Several hundred women marched in a demonstration for Women’s Rights, marking International Women’s Day on March 8, 2012, in the West Bank town of Qalandiya. we got an early start the next morning to head to the village of Nabi Saleh. though it’s about 20-30 miles from Tel Aviv, it took us about 3 hours to get there, due to the combination of public transportation and occupation. the entrance to the village was closed off and guarded by soldiers, so the taxi van took us on the off-road route. shortly after we arrived, everyone began to gather at the gas station for the weekly demonstration. there were about 30 locals, and 10 international/israeli activists. i immediately felt a different energy than i’ve felt at the demonstrations in Bil’in. it was much calmer, kinder, and less aggressive. the demonstration in Nabi Naleh is led by the women and children (remember this?). we marched down the road, following the women and children who were holding palestinian flags and leading chants. as we approached the entrance to the village, the soldiers started shooting tear gas, as per usual. the young boys flung rocks in sling shots toward the soldiers. this “game” went on for about another half hour. eventually we all walked back to the gas station, said goodbye to the internationals, and went back to Bassem and Nariman’s house. members of french media came to interview the oldest daughter, Ahed, about her involvement in the resistance. the reporters had wanted to see some photo album, but ahed couldn’t find it since their house had recently been raided by soldiers, who most likely took the album. this is something they often do to help them connect who knows who, etc. Ariel and i then went to interview the mothers of 3 of the 17 members of the Tamimi family who are currently in israeli prison, charged with throwing stones at soldiers. many of them are on the Nabi Saleh soccer team. We are working on getting a campaign going to get them released. the interviews were as expected. extremely heart wrenching and painful to listen to. for all of the ones we interviewed, it was not their first time being arrested. we stayed overnight at Bassem and Nariman’s house. 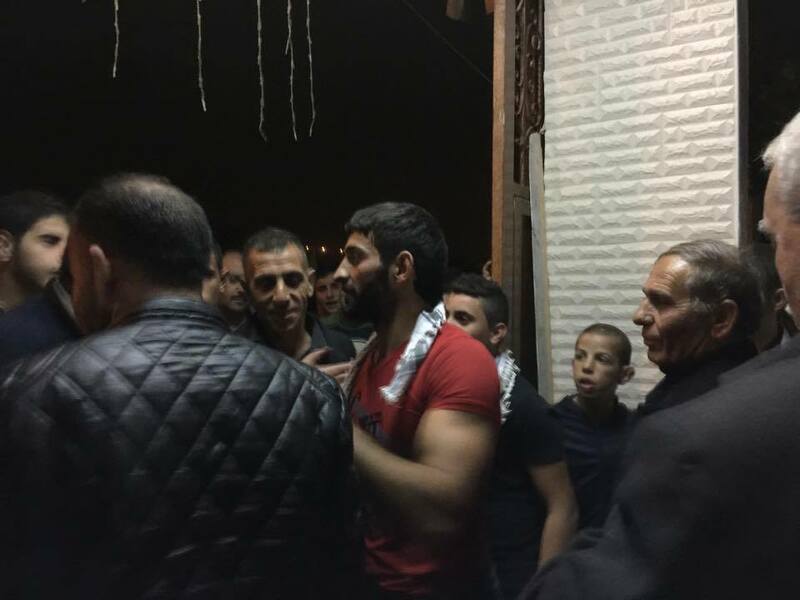 right before bed, Ariel looked at her Facebook, and learned that the YAS center in Hebron was under siege by settlers and soldiers, the coordinator (Issa) and one of the activists (Ahmed) had been arrested. so instead of staying in Nabi Saleh on saturday for the big soccer tournament they organized for all the neighboring villages, we hit the road for Hebron first thing in the morning. when we finally arrived at the YAS center, we saw a group of about 50 settlers eating lunch at tables set up outside of the YAS center, surrounded by soldiers to “protect” them from the palestinians and internationals. they had been there since the night before, when the soldiers had come and arrested Issa and Ahmed. we sat at the center with the other palestinian, international, and israeli activists, watching the settler families enjoy their lunch with the utmost air of entitlement and smugness. we watched as the settler kids took over the soccer field where the palestinian kids had been playing. when the settlers started singing (er, whining) shabbat melodies, ariel and i decided to sing our own. we stood at the gate of the center, looking out onto the settlers, and sang Shabbat Shalom Hey, Hinei Ma Tov, Lo Yisa Goy, Shalom Rov, and a couple others. one of the palestinian activists, Sohaib, joined in for Shabbat Shalom Hey! 🙂 the singing roused confusion and curiosity in the settler kids who slowly started congregating near the gate, staring at us, extremely baffled. i saw some of their lips involuntarily moving to the words that are so familiar to them. I am sitting outside the Youth Against Settlements center watching Jewish children head down the hill for Shabbat morning services. I have been in Palestine/Israel for around 3 ½ weeks now and am now in Hebron. Hebron is the most severely occupied city in the West Bank. There are soldiers and checkpoints everywhere throughout the old city, intimidating and restricting Palestinian freedom of movement. I have been here for less than a week and so far I have witnessed numerous night raids on entire Palestinian neighborhood for the purpose of “mapping” – acquainting soldiers with the neighborhood layout of families and making a show of power, numerous arrests of young children where access to their parents and information about where they were being taken was denied, tear gassing of a girls school so severe that the young children had to receive oxygen, and more. 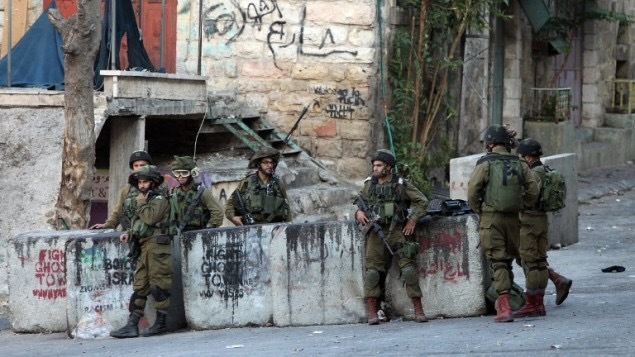 Yesterday around 50 Palestinian youth were injured with live bullets at a weekly demonstration. The week before I arrived the center for the nonviolent organization, Youth Against Settlements, was raided by the army; Palestinians and international activists were held hostage for over 24 hours and around $15,000 of the equipment they use to for education and to document human rights abuses was destroyed. The soldiers are bad here, but the settlers are worse. There is a Jewish woman who is notorious for trying to run over internationals and Palestinians with her car and a Jewish man who pretends to be a paramedic. He drives an ambulance but has no medical training or skills and arrives at scenes of injury to Palestinians for the purpose of impeding real medical assistance and causing further harm. While here, I have come to associate tzizit, kippah, and the star of David as synonymous with rifles, machine guns; harassment and/or impending injury. I have somewhat adjusted to this association, but this Shabbat morning it is more difficult. I find a part of myself wanting to forget that the soldiers and Jewish settlers call me a whore and traitor. I find myself wanting to follow the tallit wearing youth down the hill, wanting to hear the morning prayers. Quietly, under my breath I say the Sh’ma and feel tears well up in my eyes. I wonder what has become, and what will become, of Judaism? The parade of cars beeped and people hung out of the windows waving Palestinian flags. A person from the village had just been released from jail. We were invited to come to the family’s house to participate in the celebration. In the street there was music and the young man who had just been released was being carried around on people’s shoulders. As three women, we were ushered into the courtyard where the women were. We met the grandmother, mother, aunts, cousins, and more. Treats were being passed around and the women invited us to dance. “Inshallah, inshallah.” The young man being released had served a three year sentence in prison. The Israel army drove through the village in armored jeeps that night making sure to keep a chill in the air, letting people know that the occupation continues. 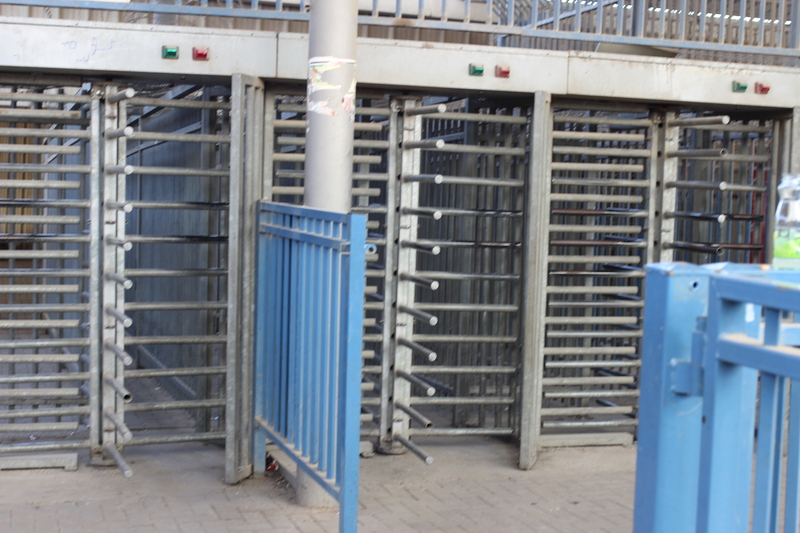 I went through the Qualandia checkpoint this morning to get from the West Bank to Jerusalem. Narrow cattle like bars and waiting for the flash moment when you can move through locked turnstile led to a metal detector for your bags and person – like airport screening but dirty and degrading. 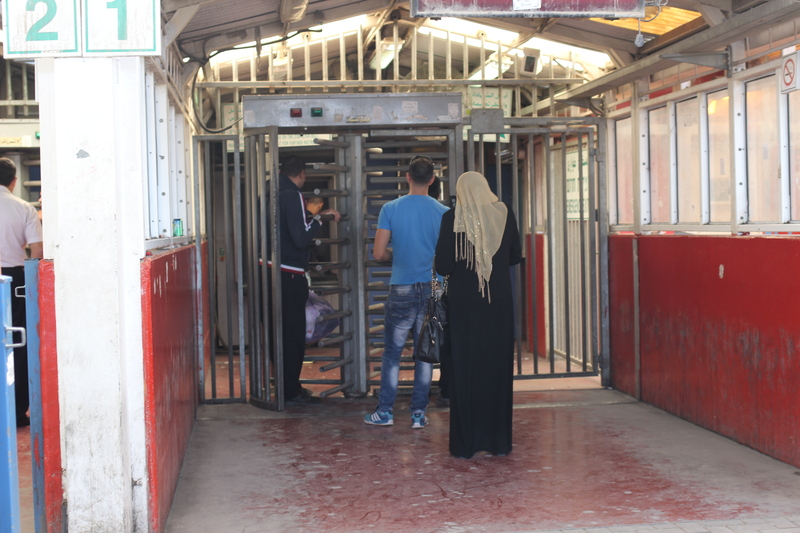 On the other side of the metal detector a man pressed his ID papers up against the glass for the soldiers’ approval. Another gave his finger to the electronic fingerprinting machine. A mother passed through with her young child and the buzzer went off. The soldiers behind the glass told her to take off her shoes and put them on the conveyor belt. With only stockings on her feet she walked across the dirty floor and through the metal detector one more time.